May 31 correction: May 2009 is the 6th wettest in Washington. 6:30 pm Update: The additional 0.32" at Washington National since 5:00 puts this May past 1989 into 6th place. Continuing thundershowers this afternoon have added to the already soggy May rainfall totals in the Washington, DC region. Month-to-date totals through 8 am this morning were already above 150% of average for the District of Columbia and much of adjacent Maryland and Virginia. 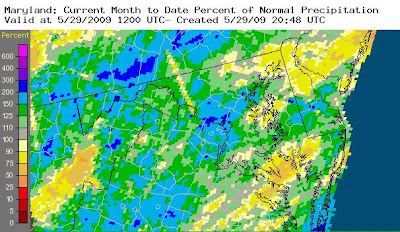 Amounts have been particularly high in southern Montgomery County, MD and northern Fairfax County, VA, where some places (dark blue on the map) reached 200-300% of average before today's additional downpours. The total at National now makes this May in the 7th wettest in Washington history. clear long-term certainty on incentives, targets and time lines for unleashing the private sector strategies and investments needed to make a low-carbon economy possible. A RECORD RAINFALL OF 3.59 INCH(ES) WAS SET AT WASHINGTON DULLES DC TODAY. THIS BREAKS THE OLD RECORD OF 1.59 SET IN 2002. These are all at least 100% above average, but still below the monthly records for May. Notice the high percentage of the 5-month total accounted for by May alone. The reading at Dulles is more than double the previous record for May 26, 1.59" in 2002. It's also close to the all-time daily record for May, 3.73" on May 11, 2008. 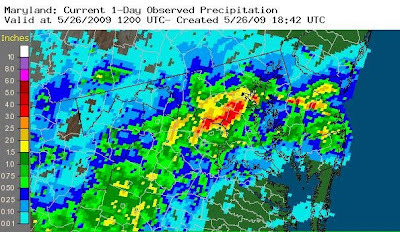 The BWI amount is also a daily record, exceeding the 1.72" on May 26, 2001. At Washington National, the total is just slightly higher than the previous record of 1.49" in 2001.